Southeast Asia is home to a wind energy “goldmine” just waiting to be tapped. Leading the way forward is the Philippines with an estimated technical potential of around 70 gigawatts (GW). However, Indonesia is not to be outdone in this regard. The largest economy in the region has attractive demographics and a surging power demand. This demand is being increasingly met via sustainable means like wind and solar energy. The archipelagic country has an estimated total potential for onshore wind energy of 9.3 GW, according to the International Renewable Energy Agency (IRENA). Based on the distribution of the evaluated sites and the identified short-term potential across wind locations, it is estimated that nearly 85 percent of wind power potential in the country is in the Java-Bali, Sulawesi and Nusa Tenggara regions. IRENA states that the Indonesian government targets 1.8 GW of installed wind capacity by 2025, with capacity factors estimated at 20-30 percent. IRENA also assumes that installed capacity will further expand to 2.6 GW by 2030, 28 percent of the total potential identified so far. About 74 percent of wind energy potential is assumed to be in the Java-Bali region, given the combination of good wind resources and a high demand for electricity. One major challenge that Indonesia faces in deploying wind energy is cost. The cost of developing wind energy is very high, especially with the use of off-shore wind turbines. IRENA indicates it costs around US$3- to US$4 million per megawatt (MW) to build off-shore wind turbines, compared to geothermal power plants that cost around US$2- to US$3 million. Coal-powered plants have an average capital cost of less than US$1 million per MW, which of course makes them even more appealing to deploy. Another challenge is the cost for analysis when selecting the best possible energy generation method to suit the Indonesian geographical landscape. Due to the many alternative energy sources available in this archipelagic country, such as geothermal, coal and solar, it is a challenging process for cost analysis to be carried out. Nevertheless, Indonesia has taken steps in the right direction to harness the vast potential of wind energy for the betterment of its citizens. The country’s first ever utility scale wind farm - which is also the biggest in Southeast Asia – is located in Sidrap, South Sulawesi and was inaugurated by Indonesian President, Joko Widodo (Jokowi) in July this year. It will produce 75 megawatts (MW) of electricity using 30 Gamesa 2.5 MW turbines. The farm is expected to deliver power to around 70,000 households. This wind farm project was constructed by Australian-based UPC Renewables in collaboration with a local partner, with an investment totalling US$150 million. 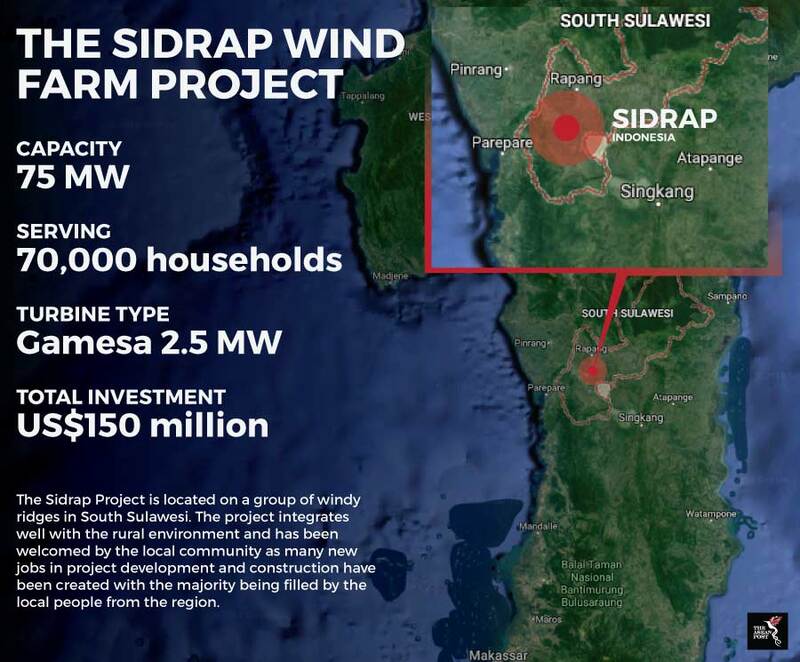 A similar wind project is currently being developed in Jeneponto, located in South Sulawesi, of which construction is approximately 80 percent complete. Besides these, several other wind farm projects are currently being developed in Tanah Laut, East Kalimantan and Sukabumi, West Java. Indonesia has set a target for renewables to make up nearly one-quarter of its energy mix by 2025 with 1,800 MW of wind projects targeted for completion, according to IRENA. Currently, wind contributes just 12 percent to the country’s energy mix. Environmental benefits aside, deploying more renewable energy also means that consumers will enjoy lower power rates in the long-term. “Transitioning to cleaner energy will protect us from the changing policies of nations we purchase our fuel and coal from as well as their diminishing supply,” said Guido Alfredo, President and CEO of renewable products manufacturer, Emerging Power. This will affect consumers who will end up having to pay higher prices when coal or fuel prices spike. Choosing a renewable energy system such as wind means that power rates will be fixed as opposed to traditional power sources where prices are vulnerable to a variety of developments, globally. Since the energy will be sourced internally, the economy will not be exposed to the fluctuations of an international market. This article was first published by The ASEAN Post on 14 February 2018 and has been updated to reflect the latest data.